You are well protected today with the ability to take your ideas forward into other areas of your life without fear of what may happen next. It seems you have spent a lot of time building power both within and without yourself and it is time to call this power forth now and use it to realise your goals. You have the strength to accomplish anything you want and all it takes is that first step for the goal to roar forth. What you are wishing for comes from your heart, intellect and intuition. Nothing and no one will hold you back as you have made sure everything is in place and you are well protected from anything going wrong. Not for you the gentle energy that courses through one when they are getting ready to release a new project or chapter in their life. You have planned this change for a while and know exactly how much energy you need to put into it. The stars allow you to make more than one wish. 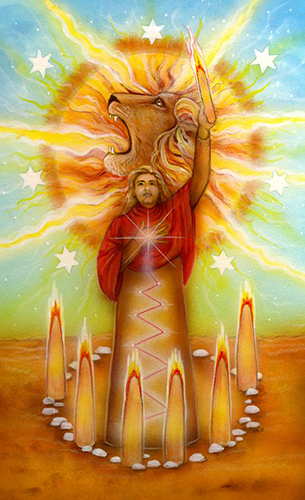 The lion gives you energy and a voice to be heard while you stand within a protected circle and launch what you have been hoping to begin for a while. This image reminds me of manifesting and if you are wanting to manifest something today use this image to alter your mind and focus your intentions on what it is you hope to manifest into your life and expect it to happen. Everything starts with a thought… today your thoughts are shouting! The card used for today’s tarotscope — Seven of Wands — is part of the self-published Star Tarot series by Cathy McClelland. This is a 22-card Majors only deck which is sold out. However Cathy has signed with Schiffer Publishing and is in the process of completing the deck. She is working on the Minors at present. Check back with Cathy on her website to see the progress of this beautiful deck!